As preparation for her next concert of many hands on many pianos on 14th July 2012 in Maui, Anne Ku discovers other interpretations on the Internet. In preparation for my next concert in mid-July on Maui, I decided to check out performances of the selected works on the Internet. The interpretations are much faster, crisper, and cleaner. It’s really hard to play fast, crisp, and clean —– that is, with many pianists on many different pianos. Darius Milhaud’s Paris: Suite for 4 pianos spans different arrondissemont of Paris. I try to remember the Paris I know but I only remember Montmartre, L’ile Saint-Louis, and the Eiffel Tower from the 6 movements. I could not find a video clip of this fantastic work against the different scenes of Paris though the 2 on Youtube are sufficiently interesting. This piece is by far the most demanding of our entire 1.5 hour program. Next, I looked for Gerald Busby’s Four! a statement for 4 pianos. Instead, I found Plucked — 15 hands on one piano. It’s a most remarkable and funny piece. If you have time to watch it, do enjoy the performance art. Another 4 piano 8 hand piece is Wallace DePue’s 16 Pawns. It’s a short and fast one page work. No videos on the Internet. No background description. Perhaps we can get our own recording at the concert. We will be playing two multi-hand pieces by Robert Pollock, founder and artistic director of Ebb & Flow Arts, the non-profit organization that is putting together this concert of Sunday 14th July 2012. The titles reveal just how many pianists and pianos. Five for Four. Three for Six. Answer: Five pianists on 4 pianos. Three pianos for Six hands. I finally get to play a work of Morton Feldman, a composer I have heard much about but never studied. His “Piece for 4 Pianos” is interesting in that all pianists have the same score. It’s up to each pianist to decide when to play each note. Everything is soft. The result? a kind of rippling, echoey effect. Watch the meditative result below. John Cage’s “Music for Piano” is another aleatory piece (one which the composer instructs the performer to decide on duration or other aspects of the composition). We each chose two consecutive pages from the album. It’s prepared piano at its best, though it would take about 30 minutes to prepare. We each have a bag of black rubber and white felt objects to insert between the strings of the piano for those notes we need to mute. The result? Texture that we’d otherwise not hear. Again, we decide when and how long to play each note. Last time we had agreed on the piece to last 7 minutes, but some of us were too fast and others too slow. It does take some practice to get 4 pianists to end at the same time. Sadly there is not enough music for many pianos. Ebb & Flow Arts commissioned composer Thomas Osborne to write one for us. The mp3 version of his “Canyons” for four pianos is very powerful. I will try playing it today. Luckily there is plenty of fun pieces for two pianos and even two pianists on one piano. As 14th July is Bastille Day, we decided to choose works of French composers. Ravel’s Mother Goose Suite; Faure’s Dolly Suite; and Debussy’s Petite Suite. I am so glad to be able to participate this time. Last year my multi-hands on one piano work “Three on One” was performed in the Battle of the Pianists concert in Maui while I was in Utrecht. Ironically, rehearsing these multi-hand, multi-piano works with other pianists just makes me miss sightreading chamber music with string and wind players even more! Free concert – no reservation required. Get there early — last year was standing room only! We arrived at the public library at exactly 2 pm, just when the concert was to begin. It was an old habit from my conservatory days —- never arrive too early to have to wait, but arrive just before it’s to begin. In this case, we had been cycling through colorful neighborhoods visiting open studios of artists. It was a beautiful sunny day, and giving up 1.5 hours (from our open studio journey) to a concert seemed almost a waste. Except it was free. That made it worthwhile. The open studios were free. We even had a free lunch provided by one of the artists. Had it not been written in our plan, we would have skipped the piano concert and spent the rest of the afternoon on our bicycles. There were many leaflets on the table in the concert hall. We grabbed the single A5 sheet program and the library newsletter. A black grand piano stood on wheels on stage. From the sign “Please do not play the piano” it would appear that the piano lived there. It was not rented or brought into this space for the occasion. As a pianist, it’s my second nature to locate venues that have resident pianos, especially grand pianos. A man welcomed us to the concert and announced the name of the pianist. We clapped and watched a young lady try to open a heavy door from the side. Out of courtesy and respect for the young pianist, we clapped until she arrived at the piano bench and bowed. While she played, I started to hear other sounds. The opening of candy wraps. The sucking and popping of candies. I got so annoyed that I decided we should move our seats during the intermission. We waited. Just before the second half, we made a dash for the front row. We were no longer sitting in front of the candy-slurping ladies. The second half was several decibels louder than the first half. Whereas the first half was lyrical, the second half was deliberately fast, furious, and intense. The audience sensed it. This gave some the license to talk, move, and annoy us even further. The lady behind us began to open, squeeze, and close her old plastic bag. I cringed. The Korean pianist was excellent. She played selections from Albeniz, Grieg, Chopin, Tann, and Beethoven effortlessly. She even gave an encore of Chopin’s famous Scherzo. I couldn’t wait to talk to her after the concert. The audience? I gave the audience an F. I couldn’t wait to get away. But how could I possibly complain? It was a free concert after all. The audience could do as they please. I daresay this was probably the main reason I chose to organize concerts in my own home. Such audiences are not welcome. I set the rules. And you have to pay for the privilege of attending a house concert. Henk Alkema, Dutch composer, pianist, and teacher, passed away on Thursday 4th August 2011. A memorial service will be held on Tuesday 9th August at 12 noon at the Koeshuis van Boerderij Mereveld at Mereveldseweg 9, Utrecht followed by a funeral at the Soestbergen, Ganstraat 152, Utrecht, Netherlands. On a sunny Thursday morning, I cycled by the home of my composition classmate Mari-anne Hof to post a letter and see if she was around. I had not seen her for a year. I felt the need to tell her that I had gone to see our teacher Henk Alkema recently and that he was not well. In fact, he was dying. But he didn’t want to tell the world about it because he had only a few productive hours a day and he wanted to finish his last opera. It’s like that with composers. You feel the urge to compose. You don’t want to be interrupted. You want to write before it disappears. We live less than 1 km apart — a mere 12 minute walk from my house to Henk’s houseboat — which translates to a 2 minute cycle ride. Mari-anne’s house is even closer. In this radius, there are other musicians. There’s no excuse not to get together. But we work for ourselves, and time to create music is precious. What do you do, if you know someone is dying? I struggled with this. Knowing he didn’t want to be disturbed and that I was leaving shortly, I wanted to tell others before it was too late. But even if I told others, like Mari-anne, what were they to do? The answer came too early. This morning I received several e-mails that Henk Alkema had passed away on the same Thursday 4th August 2011. Gistermiddag is Henk Alkema tot ons groot verdriet overleden. Ik stuur je hierbij een pdf van de rouwkaart en een persbericht. Ik vraag je namens Anna Schweizer of je zo lief wilt zijn dit bericht op grote schaal te verspreiden. Het is vakantietijd dus veel mensen – studenten en docenten – zullen dit bericht missen. Misschien heb je zelfs in je oude emails een groepsmail van of voor leerlingen, die we kunnen gebruiken. En misschien wil je ook iets zeggen bij de herdenking. Dat zouden wij allemaal heel fijn vinden. Edwin Rutten en ik zijn goede vrienden en regelen de begrafenis met Anne. vandaar dat ik je dit bericht stuur. 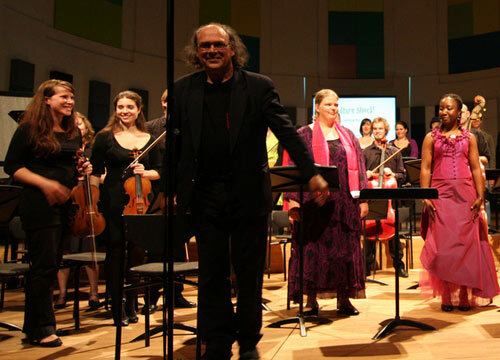 Thursday, 4th of August, our great friend and teacher Henk Alkema passed away. He has been ill for some time, but no one was prepared for him to leave us this soon. This Tuesday his funeral will be held. He’ll be buried on Soestbergen, in Utrecht. a small gathering to pay condolences to the family at the rouwcentrum in Yarden at Floridadreef 9, Utrecht. Memorial service: (a larger gathering than the previous) at the Koetshuis van Boerderij Mereveld at Mereveldseweg 9, Utrecht. From there (around 13:30), we will proceed to his final resting place at the Soestbergen, Gansstraat 152, Utrecht. Parking is limited thus preferrable to park at Kovelswade, Koningsweg 49 where a gathering with the family will take place after the funeral. 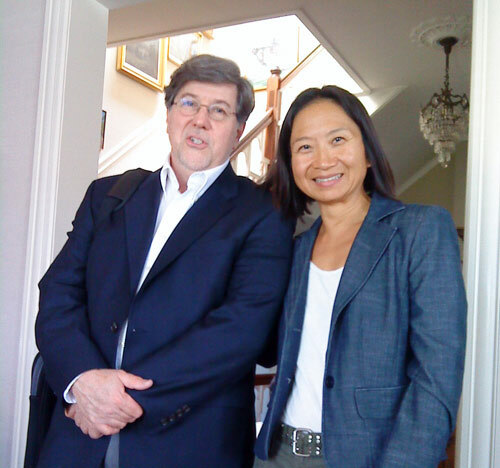 Anne Ku introduces John Bilotta’s colourful piano duet to other pianists in Maui, San Francisco, and Utrecht, Netherlands. Few duets out of the 42 I accepted in the Call for Scores for Multi-hand duets received the full mileage from Maui to Utrecht. 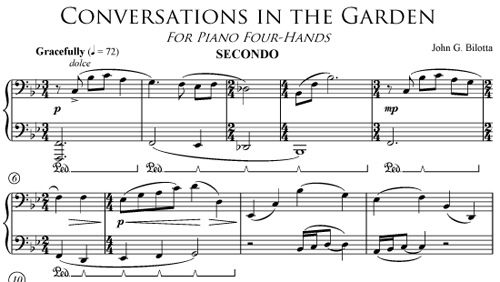 John Bilotta’s piano duet “Conversations in the Garden” was sightread in Maui, studied and performed in San Francisco in his presence, and sightread again in 3 places in Utrecht Netherlands. On its return journey to Maui, the duet will be recorded. 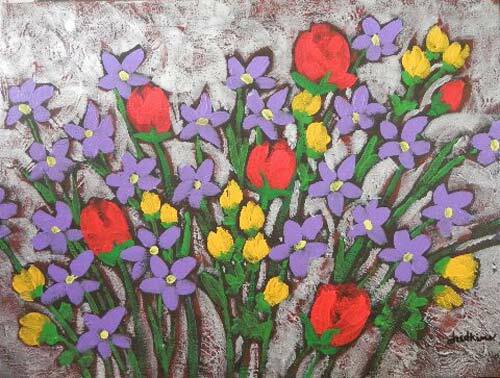 The title “Conversations in the Garden” evokes images of spring and the flowers in my garden. I missed it this year in Maui where there’s an everlasting summer. Luckily I am on the special mailing list of my artist friend from high school, Robby Judkins. Now based in Columbus, Georgia, Judkins captured my imagination well below. In his new quatre-mains work, John Bilotta painted a nice image of the colours of conversations and what we expect in a garden. The duet meanders from an initial 3/4 time to 2/4 to 4/4 to 3/4 just as easily as it moves through different tonalities. Conversations are like that. You start with one subject but easily go off in tangents, returning now and then, sometimes overlapping different strands or themes. You never really stay focussed on one topic but stray off to others. Well-written and laid out in parts, the 2.5 minute duet sounded better each time we played it, for each time we understood it better. The dynamics and other notational marks are intentionally and clearly indicated. This kind of detail makes performers feel secure that the composer knows what he is doing. To some degree, a work that looks final (i.e. ready to be published or already published) validates itself. The pedal markings are noted in the secundo part. I have been working with the material for Conversations in the Garden for some time trying to find just the right form in which to present its musical ideas. Ultimately, I found that this four-hand arrangement best captured the tone, mood, and play of voices—in particular, the opportunity to space the musical lines vertically allowing the inner voices to be heard. Conversations is built from a simple motif and its transformations in an chromatically rich harmonic structure. It should be played with a quiet and graceful elegance, without excessive show, larger phrases swelling and subsiding in breezes and waves. Confident that Chong Kee Tan, the organiser of the Piano Soiree in San Francisco in May 2011, would sightread and play this piece with me, I invited John Bilotta to the event. It was a pleasure to perform the duet in front of the composer.